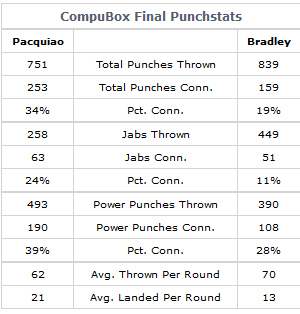 Manny Pacquiao connected on 253 of 751 punches (34%), compared to 159 of 839 (19%) for Timothy Bradley, and outlanded the challenger in 10 of the 12 rounds. Bradley’s big weapon has often been his head. For most of his career, the 5-foot-6 Bradley has fought taller fighters. As such, he often lunges forward when he punches, which frequently leads to head-to-head contact. In 2009, a TKO win over Nate Campbell was changed to a no-contest after it was ruled that it was Bradley’s head, not a punch, that opened up the cut that stopped the fight. Last year, Devon Alexander complained that Bradley head butts opened up cuts on his face, too. Pacquiao’s camp was rightfully concerned about Bradley’s head-butting, dubbing him “Billygoat Bradley.” Avoiding Bradley’s dome has been a very specific part of Pacquaio’s training. Pacquaio had no need to fear any damage from head-butts—his real opponents were the judges. Ringside judges Duane Ford and C.J. 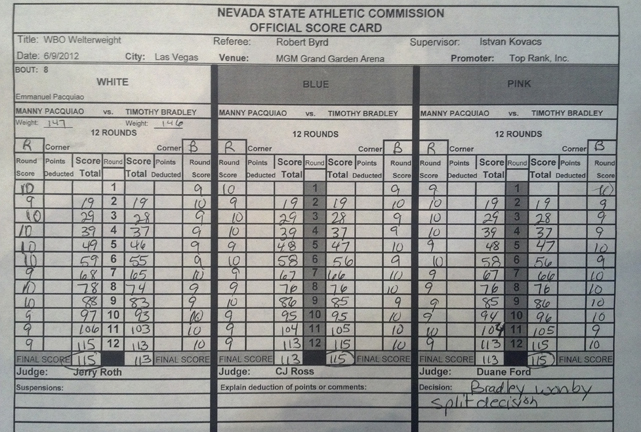 Ross both scored it 115-113 to Bradley, dissenting with Jerry Roth, who had it 115-113 to Pacquiao. Ringsiders had it as 117-111 in favor of Pacquiao—but ringsiders like most of the rest of us just don’t count. Who are these one percenters, Duane Ford and C.J. Ross who gave the bout to Bradley? Duane Ford, a sharp-eyed 73 year old, is a very active judge, and will next be “working” the Ann Sophie Mathis – Holly Him ladies bout on June 15th at the Route 66 Casino, in Albuquerque, New Mexico. This is not exactly big time but can help out with Duane Ford’s social security payments—if he still needs them after the Bradley decision. C.J. Ross is a lady. Her first name is Cynthia. Duane and Cynthia have worked together before, most recently at the November 12, 2011 bout at the MGM Grande between Juan Carlos Burgos and Luis Cruz. If you look at the records, found here, you can see that the Las Vegas “judges” are recycled over and over again. It’s great work for a senior—if you can get it. Thanks to Duane and Cynthia, at this point, Manny Pacquiao has as much of a chance of fighting Floyd Mayweather Jr., as he does fighting Mayweather’s dad, Floyd Mayweather Sr.
Manny Pacquiao was indeed, robbed of his TITLE! I watched the fight, and Manny clearly won! What an outrage! 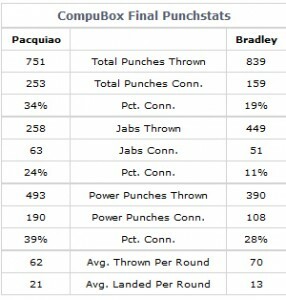 Everyone else wonder WHY the judges ruled in favor for Bradley? How crappy is this decision? It means that Manny has to TKO any fighter in Vegas to get a solid decision in his favor and get his title! Manny P, we’re very disappointed with this really wrong decision! Well, the only way to find out why the verdict went the other way is to follow the money trail. I am sure some people made big bucks out there. Manny Pacquiao is going to take on against Mexican boxer Juan Manuel Marquez. A rematch with Bradley will probably take place after the fourth fight with Marquez. All about the ticket sales. If Floyd ever fights pacman, you may see more of the same decision making.